On my first trip ice fishing, I fell through the ice. It was 15 years ago and I was with my father. 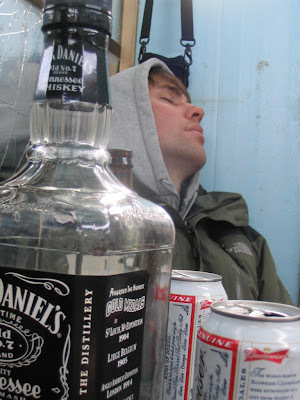 The winter doldrums had me in a state of obvious depression, and any type of fishing was better than sitting inside the house and watching the snow fall. 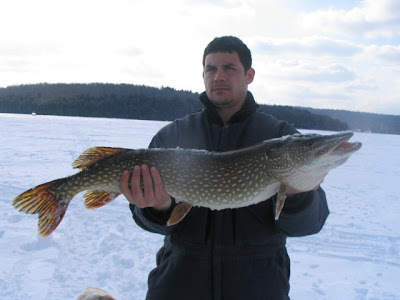 My father had told me stories about his boyhood ice-fishing experiences catching largemouth bass and pickerel through the ice of the cranberry bogs and small ponds of Plymouth Mass. It was my first year in Massachusetts, and the winter season represented a largely unknown entity. The idea of catching fish through frozen water was intriguing. We went to K-mart and bought 4 traps and a hand powered auger. A quick trip to the local bait shop in Maynard and we were ready for a new adventure. With a dozen swimming shiners and our new ice fishing gear, my dad and I headed to a small Carlisle pond where I had found pickerel during the summer season. I left the laborious process of hand drilling through 12 inches of ice to my father and after an hour and a half of drilling, scooping, and setting, our lines were in the water. We were fishing and I was bouncing around on the ice as only a 12 year old can, winter starved for the pull of a fish. Unfortunately the fish didn’t respond to my excitement and after an hour of waiting my enthusiasm waned. The small pond we fished was the product of a dammed stream, likely only 8 or so feet deep in the center. My focus switched to exploring the snow covered terrain. I walked down towards the area where the stream exited through a concrete grate and then it happened. I heard a crack and suddenly I was waist deep in water. My father, in temporary panic, ran from the center of the pond and grabbed my outstretched hands, dragging me back out onto the ice in a matter of seconds. I was cold, wet and startled, but completely fine. My feet had hit bottom in the shallow water where I fell through. After my accident, we elected to call it a day. My father picked up the traps as I watched from shore with a sense of reservation, very uncertain about this process of fishing while standing on such fragile terrain. As we walked home my father explained to me why I had fallen through, and while his explanation of current and its relation to ice thickness made sense, I was still uneasy. On my second ice fishing trip, I fell through the ice. It was the following winter and again it was my father and I engaged in a weekend effort to ease my cabin fever. This time we were on our way out to a fishing spot and crossing the marsh behind my family’s Carlisle house. The ice was 18 inches thick in most spots, but as I quickly learned the ice was much thinner over weed beds that reached up to waters surface. This time I fell through to my chest before my feet touched bottom. I was able to crawl back out of the cavern I created before my father reached me to assist. Again, cold and wet, our ice fishing trip was cut short, this time it ended before it even began. Two ice fishing trips, two trips through the ice, no fish caught. To say that I was skeptical would be an understatement. I wouldn’t fish the hardwater again until my sophomore year at Bates. The initial meeting of our newly founded Bates Fishing Club put me in touch with legendary man of winter Andrew Wilkie. He detailed stories of monsters pulled from the cold depths of frozen Maine lakes and ponds and my enthusiasm was instantly renewed. The first fishing trip of the BFC found me on the frozen surface of Range Pond. Wilkie had arrived early with Goat and lines were already set. Over the course of that fishless day, it became clear to me that ice fishing was more than just catching fish, it was an experience, and a truly unique one at that. 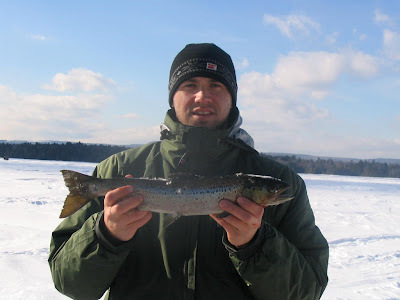 The silence of the Maine winter, the company of good friends, and the serenity of picturesque surroundings make ice fishing truly special, completely unique, and in a certain way pulling up a fish or two is really just an added bonus. I won’t waste time detailing the social aspects of that day on Range. Those legendary stories are best told over a beer and a dip in the company of good friends. What I will say is that our trip to Range Pond brought me a new recognition of simple and beautiful things; cold crisp air, solitude, and a few hours of peace in a busy world. 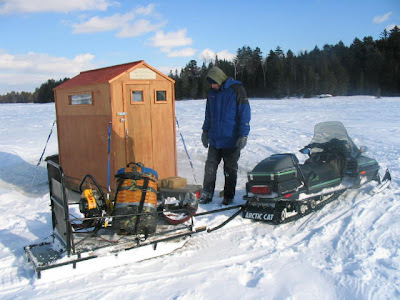 I’ve since made winter ice fishing trips a priority and every year I try to maximize my time spent in frozen Maine. I’ve since caught fish through the ice, some large, some small, almost all a credit to Wilkie and Jesse and others who know much better than me how to entice fish during the heart of winter. But again, the fish aren’t all that important. Those who have been there, experienced it, understand what I mean. my first memories on the ice are with my father as well. i think our outings were slow, but it mattered not. the freedom of the water we sought. Brothers, the season approaches. Ice covers most small to medium ponds in the area with a good two inches or so. Larger lakes are partially frozen, but with evening temps dipping into teens over the next week you can be sure that things will snap up for good soon enough. I look forward to this season's memories.